Swim at least twice per week. For sprint distance races work up to twice the required lengths per workout. Work in drills with each practice (intervals, differ your strokes). Practice a speed workout once a week. Practice an endurance workout once a week. The long swim is the key to the swim success, it causes you to swim more efficiently. Follow the 10% rule for increasing distances. If you are a swimmer who believes they can’t swim at all you will want to follow this basic start up guide and view the video links at the bottom of this page. 1. Start by simply proving to yourself you can float. 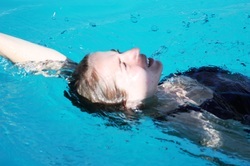 In the shallow end of the pool take a big breath of air then lean forward and float with your face down. Let your arms and legs lose contact with the pool floor and work to maintain your float as long as you can. You should be able to float as long as you can hold your breath. 2. After you master the forward float repeat the same process only this time float on your back. A key to floating on your back effectively is to extend your chin away from your chest. If you drop your chin to your chest your head will sink. It may take you several trips to the pool to master the task of floating but that is OK.
3. As soon as you feel you are good at floating proceed to pushing off the wall frontward and backward and floating as far as you can across the pool (stay in the shallow end of course). You will be amazed how far across the pool you can get simply with a good push off the wall. 4. After getting to the point of feeling comfortable pushing off the wall you will be ready to try to dog paddle or backstroke across the pool. The technique for doing this will be explained in detail in the upcoming swimmer instruction. If you are a swimmer who can already get across the pool at least once without touching the bottom but lack confidence to do so in the deep end of the pool at this time you should set your sights on doing the minimum workout, just getting across the pool 10 times consecutively (in a pool the length of Hooper’s). Do this by using whatever stroke you are best at. Dog paddle, breast stroke, freestyle or backstroke. Stay in the shallow end of the pool if you need to do so to maintain your confidence but do your best not to touch the bottom during each length you swim. Remember a good push off the wall will get you 1/3 of the way across the pool without a stroke so work hard on this. If you swim backstroke remember to keep your chin off your chest. You sink when you put your chin to your chest. If you dog paddle work at keeping your head back. If you breast stroke, work on your breathing. Be sure to expel air when you are under water and take in air when you are above. A big mistake most beginning swimmers make is to not expel enough air before taking in more. This causes hyperventilation. If you are trying to freestyle, work on keeping your head down while underwater and work on breathing to the side. If you are a good enough swimmer to already do the 30 lengths at Hooper you will be required to do in the triathlon, our advice to you is to go ahead and at least do 30 lengths during each of your workouts. It is hard to injure yourself swimming so any time you want to swim more than you have been advised to, just go for it.